Delve deep into the stylish, functional and extremely practical selection of sophisticated divers watches here at Watches.org.uk. With an enormous choice of the latest divers watches you’ll find watches tailored to the outdoor activity you love to pursue. Tough and resilient your divers watches must withstand the harshest of elements diving in deep oceans but they must also perform on land as well. So whether you’re white water rafting, sailing or simply caught in the rain your divers watch will prove worthy and will match your lifestyle. Divers watches aren’t just for the brave and the adventurous. 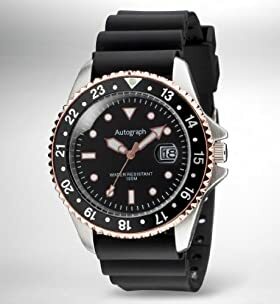 Divers watches are fashionable mens watches and ladies watches. With chic designs from Casio watches and Rotary watches are available to buy online through Watches.org.uk for under £50. Divers watches are affordable timepieces for birthday and Christmas gifts. Give the gift of a divers watch to a friend or someone in your family who will make use of this tried and tested type of watches suited to the great outdoors. For the professional diver demanding absolute precision, reliability and scope for handling extreme conditions take a look at the high end range of Omega Seamaster watches, Bremont Automatic Chronometer watches and Oris Pro Diver watches. Take your divers watches deep underwater, dry them off and wear them into the office. Divers watches offer reliable timekeeping from world renowned brands you know and trust. Combining style and tough materials your divers watches will bring out the relentless adventurer in you and guide you with the best time features wherever you choose to go.